So how is the game so far? I am curious to know. Well, only on day 5 at this time. Interesting seeing the game unfold and how things are running. Not sure how many people are actually playing though - either there are bots or clueless people in maybe half the houses. There's hardly any chat - typically a game attracts people for gameplay or player interaction. Will keep this thread updated at things unfold further. I've been considering what the game is missing, and one of the things is suspense/flavour. My thoughts on a start: there needs to be an accurate countdown to when the turn is taking place, a busy screen while it is taking place, and then a window coming up on your first login after it has taken place telling you the important information about your family and other families regarding deaths (much like Die2nite). I know its still developing, of course, but its an idea to start deciding how to shape how the game reports events (as opposed to just giving the basic facts). I don't start games until they are about half filled up, but yes, many players seem to not play much and then there is mostly AI left. That is sad. I'm most interesting a non-PVP game. Even in PvP games, the actual hostile activity is very low so far. And even in a non-pvp match, I believe that the most damaging pvp option - take plot - is still available. This would convert the plot that you own to common ground, if the player is adjacent to you and you didn't perform any actions on that plot. There isn't reason to take plots from others or attack their huts, the game by design doesn't give the player enough actions to do everything he needs and when the forest starts actively attacking multiple squares on every plot, any size of land is either enough or too much so there is literally no point in wasting actions on PVP or at that point cooperation so the reality is not that of cooperation breaking down with interesting consequences as intended but people playing even more in single-player mode than is already the norm. If the claim land and attack options are being used I assure you its purely because of the novelty, there is no in-game reason to do either. If there was a secondary action pool per peasant, which can only been used on PVP or cooperative actions, and there was a meaningful set of both types to choose from, then it would be used and make the game more interesting without compromising intended design. The cooperative ones like transferring some amount of resources to a target hut, or repairing something on their land or giving a buff to one of their actions or lessening the chance of forest attacks or defending against other player hostile actions etc. and hostile actions like stealing some resources, partly reaping their fields, stealing their eggs, giving a debuff to a peasant action, damaging their fence, baiting a forest attack etc. Both cooperative and hostile actions would happen all the time with a dual action pool, in fact there would be a new source of friction between players as cooperative actions get distributed unequally, optimizing actions would by default need cooperation from someone too. Furthermore, both cooperation and hostility and therefore some interesting gameplay would be fueled by the same intent that prevents those things from happening currently, players will avoid wasting available actions. Also its probably best for everyone to see what everyone else's actions are planned for the next turn as they are given, the game would seem marginally more vibrant from that alone. Also, a cool feature would be to allow setting use rights on owned land so that particular players could also use my resources, help with the fields etc. maybe I have a neighbors who agrees to cooperate more thoroughly or maybe the village wants to attempt socialism, well someone could opt out of course and that would be an interesting round in itself. Being able to set where part or all of gathered resources go (for example communal stores) would be welcome. As far as being more interested in the non-pvp game, well then cooperation has to be backed up by beefier and more engaging gameplay than "man the building" because that's more of a chore and such a binary problem with predictable consequences won't generate anything interesting especially if players are discouraged and mostly impotent in their interaction choices regardless of the outcome, there's not much RP depth in "they don't man the building", in practice its single-player mode from then on at worst and 'we just man and don't talk about it because there's nothing to talk about' at best. Options need to be opened up and players need to be encouraged to make use of them instead of the opposite. My point being that current amount of actions and action choices are not enough to generate emergent interaction and simply giving players more actions won't work for obvious reasons, so extra available actions and options need to be steered towards player interaction through gameplay mechanics. Finally, I strongly feel that this type of game desperately needs some sort of random events that happen to the village (both good and bad) or just stuff happening and changing to break the monotony and predictability that inevitably sets, perhaps even some sort of interaction maybe voting on choices of how to deal with events or something village families can get around to handling cooperatively etc. and definitely some mechanics revolving around affecting forest attacks. The bones of the game are in place and its time for the meat. Without the meat, that makes every round uniquely engaging and brimming with meaningful interaction, keeps players coming back for more, the future is not encouragingly bright. Also I can't quite nail down the potential market, its sort of a 'PC' game for mobile (regardless of whether mobile is planned) and a 'mobile' game for the PC, for roleplayers who don't want to actually RP, for PVPers who don't PVP, and for co-op players who don't truly cooperate, sort of tower defense without being that, sort of strategy but not really, sort of village building but not really, sort of survival but not really. Is the game more than the sum of its parts? That's the big question and frankly I'm not entirely sure at this point, every present mechanic representing each one of those mentioned genres and types of games taken on its own merits is undeniably mundane, simple and shallow (yes, that includes the RP - its not a magic bullet - it needs an environment, a medium to work well). Furthermore, the pace and design of the actual game conflicts with simple and shallow being potential selling points. The people invited and inspired by any of those ideas are bound to be underwhelmed. The vision seems confused or maybe major parts are missing. I would have a hard time selling it. Maybe I'm missing the 'idea' and the 'project objective'. Now, of course I apologize and admittedly suffer from somewhat of an 'MBA mindset', every endeavor is a business from my perspective, just trying to be frank. The concept of the game though is pretty neat and there is demand for it, the execution on the other hand is a bit questionable. The game as described in a few sentences sounds great but when you go through the actual gameplay its a different conversation altogether. Whether it can it be made great remains to be seen. I'm sure that the archaic real-time-turn-based thing can work, but it probably has to be balanced by excellent gameplay that plays to its strengths not competes on account of its weaknesses. The strength of such a game lies in added potential for depth and complexity not in simplicity. To drive the argument ad absurdum - Candy Crush on a turn-per-day basis is going to be laughed out of the market, and not solely because it offers the wrong thing to the intended audience, but also because it does't even make sense. Slow+Deep=Yes, Fast+Deep=No, Fast+Shallow=Yes, Slow+Shallow=No. Generally speaking. Its risky to offer players 10 minutes of content per day, especially considering the predictability of the following 10 minutes of content tomorrow, I think I could make a decision flowchart for the game that negates anticipation of the next turn almost entirely because there are so few things that can happen, so few decisions and so little interaction, for me personally that's a ginormous core problem. The potential hope that because so little is asked of players they will put it into their daily schedule in addition to all the clutter of modern life is a tough sell, it is precisely because so little is asked and anticipated that will tempt to consider dismissing it altogether, the more you strip away and streamline the more is lost, that's obvious. The less is there the less engagement and at some point the thing just drops off the priority list and becomes a little chore. The elements of anticipation, that is unpredictability, player interaction and potential problem solving are lacking, the player almost doesn't need to see the next turn because he knows what actions he set into motion and their results, and what does it matter if the other player has built a henhouse instead of an extra field, so what? Its not like you can make meaningful decisions based on that or that it impact the singleplayer-multiplayer game in any worthwhile way. The Forest? Well, seeing which one of the 2 potential outcomes of the 1 thing that can actually happen (starting from mid-game onwards its mostly just 1 outcome of the 1 thing), is far from what I dare to say warrants excited anticipation. The next turn decision of whether to repair a fence or plant a field is hardly worth engaging in something over the course of weeks for most I feel. More, more, more, players always want more. But in this case seriously, more or bust. Neat game concept though, let's see how it develops. 2) A way of anonymously messaging people, and/or leaving an anonymous note for the whole town to read. Also, perhaps an option to elect people to certain positions in the town, like leader, sheriff? Perhaps also and ingame actual roster for people to assign duties, and then the leader or sheriff would enforce it? Thank you for the massive feedback, Mookzen. Yes, there are a few crucial elements missing yet. Now the basic parts are in place and I hope to connect them soon to get the gameplay that I wanted. Admitted, it is not there, yet. I'm looking at the many games I play to figure out what is missing, and my intuition tells me it is not much, but one important change in the right place and it will "click". Some thoughts I have is to make land less owned and more by "whoever uses it". Plots would get a timer, if you use it it is yours, if you don't use it for some days it becomes common grounds. This would make for much more competition and unintended conflicts as two people try to farm the same land and both fail, for example. I am also thinking about common projects the way Die2Nite has them. Maybe the tower, well, market need to be built first, with multiple families joining? Or maybe high-end buildings need at least two people working on them to complete? I will not ever show planned actions on the map. This would demolish the turn-based structure of the game and it would suddenly become important when in the day you make your turn. However, better ways to coordinate are possible, things like putting short messages on the map instead of chat. Short, possibly pre-determined, like "farming here" or "building here" or "manning this". PvP games start with only your hut being your land. Everything else is common land. If you want land for yourself, you need to take it. What do you think about this? It would be possible to run it experimentally in one or two villages and just see how it turns out. Yeah, you are right about seeing the planned actions of other's, didn't consider the timing issue. Basically game desperately needs more dynamic elements and avenues for player interaction and meaningful decisions that change according to circumstances, and some clever game design decisions might even do it, maybe. I like the idea of land ownership being based on use with a timer, that would definitely spice things up and sounds at least initially as a much better setup, but it has to be implemented in a way that also make communal structures still possible. I feel changes that encourage players thinking about land besides their own are good, not entirely sure it alone will overcome the 'turtling up' instinct as the forest pressure increases though, at that point no one can service enough land for it to be a point for any sort of player interaction when ideally engagement should increase not decrease as the game progresses, its not so much 'cooperation braking down' as everyone just not being able to do anything at that point, that's also a problem. I understand that's kind of the point eventually, but its a balancing act. So another big question is how to have things breaking down in a way that entourages gameplay instead of the opposite. Being able to set the destination of gathered resources and set use rights on land would allow for at least the possibility of more complex cooperation. Maybe players need some more room to 'breathe' in the mid and late game ? Sure, some attacks should happen every turn, but maybe the big ones come in waves, giving a few turns of less intensive pressure to players can actually do something,repair stuff. Currently its like constant pressure which relentlessly increases. The point when it become pointless to even try to maintain any sort of buildings comes a bit too soon and to everyone at once more or less it seems. You will probably see player dropoff as the game progresses, that should not be the case with good design, but its a balancing act. Need to provide opportunities for players to struggle for a bit longer in a way that's interesting gameplay wise instead of being just hopeless. I feel that 'fleeing to find shelter with a neighbor and joining forces' thing isnt developed to its potential, could be interesting, or becoming a parasite that ultimately dooms both families. What about actions that impact attack frequency and maybe even tendencies, hunt the wolves and boars actions ? Another potential area of cooperation, chance to lose a peasant unless people group up? Something like that. I noticed you didn't respond to the dual action queue per peasant idea, it came from a feeling that I would like more to do every turn essentially, more choices, more things happening in the village. If it was my call I would consider morning, day and evening actions per peasant, all 3 categories serving different purposes and offering different options. I think you have a brilliant idea with the waves there. If pressure would increase, decrease, in somewhat predictable ways, it would give days of pressure and destruction and days of rebuilding and hope. It would be easy to implement something like a sine wave of monster activity. 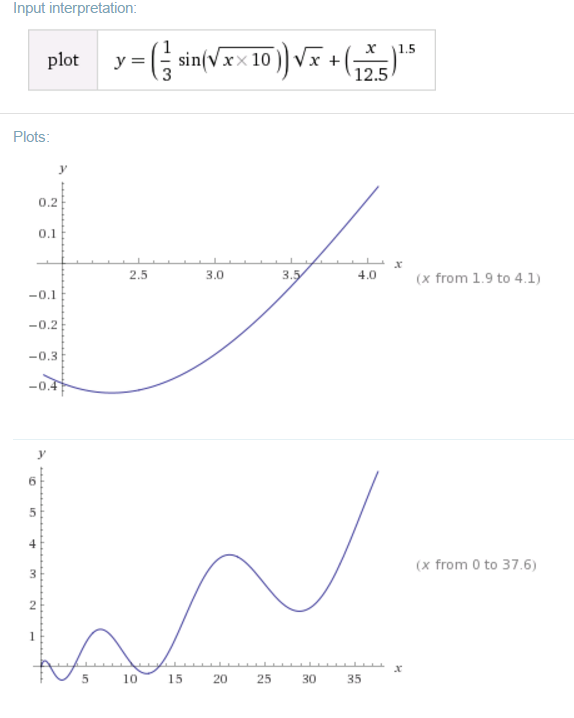 y=sin(sqrt(x*10)) * sqrt(x) + (x/10)^2 + 2 gives this nice curve. I'm sure someone with more math background can improve upon this. Continuing this thought, I'm thinking of having different, overlapping curves for the various monster types. This would allow players to calibrate a little bit better, it would make sense, and it would add some depth. There should also a way to estimate what's going on, maybe a new forest action "read tracks".